Is your hen and chickens fern a fake? Are you growing a hen & chickens fern at home? If so, chances are it’s a fake, unless you dug it out of the bush. Hen & chickens ferns get their common name from their production of bulbils, or vegetative outgrowths, on the upperside of their fronds. These bulbils are the ‘chickens’ and the fronds are the mother ‘hen’. The bulbils can grow into new individuals, as a clone of their parent. A bulbil, or ‘chicken’, of a hen & chickens fern. These are a vegetative, non-sexual mode of reproduction. Photo by Leon Perrie. (c) Leon Perrie, Wellington. 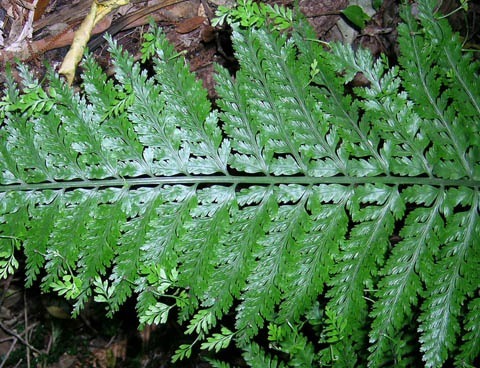 True hen & chickens fern – Asplenium bulbiferum – is found in the wild only in New Zealand. Asplenium bulbiferum has closely-set frond segments, and usually many bulbils. Photo by Leon Perrie. (c) Leon Perrie, Wellington. 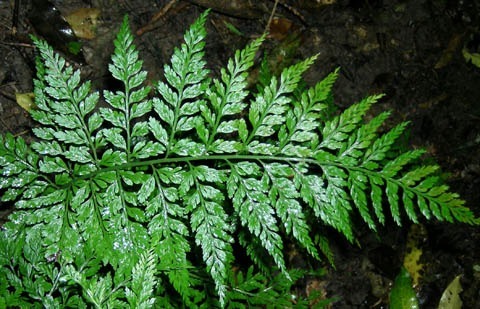 In addition to Asplenium bulbiferum, one other hen & chickens fern is native to New Zealand: Asplenium gracillimum. It is also native to Australia. 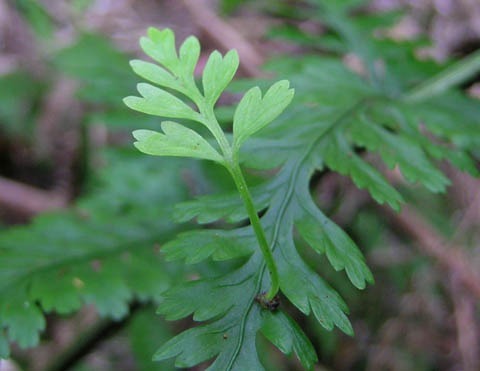 Asplenium gracillimum is an allopolyploid of Asplenium bulbiferum and Asplenium hookerianum, being derived from hybridisation and a doubling of chromosome number. Compared to Asplenium bulbiferum, Asplenium gracillimum has more diamond-shaped fronds, more space between its frond segments, and often only a few or even no bulbils. Photo by Leon Perrie. (c) Leon Perrie, Wellington. Occasional plants of Asplenium gracillimum have very narrow frond segments. These have sometimes been incorrectly called Asplenium bulbiferum variety tripinnatum. Asplenium gracillimum with narrow frond segments. 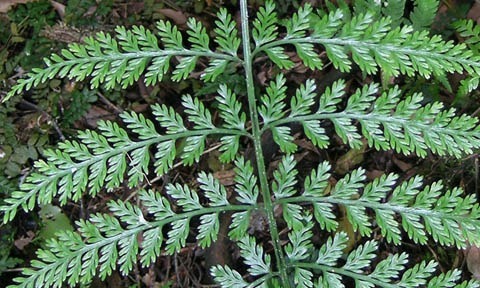 These resemble the fertile fronds of Asplenium ×lucrosum (see below), but they can be distinguished by all of the fronds having narrow segments, rather than having both broad (when without spore-producing structures) and narrow (when with spore-producing structures) segments. Photo by Leon Perrie. (c) Leon Perrie, Wellington. Most hen & chickens in cultivation are actually sterile hybrid plants properly called Asplenium ×lucrosum, despite usually being mislabelled by plant-sellers as Asplenium bulbiferum. Asplenium ×lucrosum is not native to New Zealand, but is a hybrid that arose in cultivation; its origin is a fascinating story. Asplenium ×lucrosum and Asplenium bulbiferum are frequently confused, and not only by plant nurseries: most books and websites pertaining to illustrate Asplenium bulbiferum actually feature Asplenium ×lucrosum! 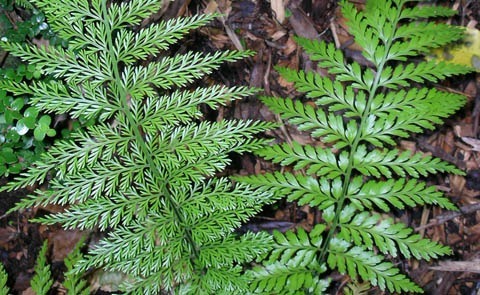 The false hen & chickens fern – Asplenium ×lucrosum – has dimorphic fronds (i.e., two different looking kinds of fronds) on the same individual. The fronds with spore-producing structures have much narrower frond segments than fronds without. This difference in form can even occur within a single frond if it has regions with and without spore-producing structures. Asplenium bulbiferum and Asplenium gracillimum do not have dimorphic fronds. Photo by Leon Perrie, Curator. (c) Museum of New Zealand Te Papa Tongarewa. Close relatives of the Asplenium bulbiferum and Asplenium gracillimum hen & chickens ferns are Asplenium hookerianum and the cave spleenwort, Asplenium cimmeriorum. The cave spleenwort, Asplenium cimmeriorum, is related to the hen & chickens ferns but doesn’t produce bulbils. It is found in limestone areas, including caves, around Waitomo and the north-west of the South Island. Photo by Leon Perrie, Curator. (c) Museum of New Zealand Te Papa Tongarewa. Thanks for the post. I have recently had my attention drawn to a fern in my new garden, which I have now identified as asplenium ×lucrosum. I see in an earlier post you’ve mentioned the NZ varieties of asplenium are edible – the A. bulbiferum definitely as the pikopiko, which is what I was hoping I had – however I’ve read that the Norfolk Island fern (A. dimorphum) this is crossed with to make A. ×lucrosum is inedible. Do you know whether this hybrid variety is edible or not? I can’t seem to find any reference anywhere online. I don’t know about the edibility of A. x lucrosum, but it surprises me that any Australasian Asplenium would be inedible. Where did you read that A. dimorphum was inedible? I cannot recall exactly where I saw it, as I trawled through countless web pages – and, to be honest, I can’t speak for the credibility of any of them – I just recall it said it wasn’t toxic, but it wasn’t edible. I suppose it is a bit of a niche market, which I guess is why there’s not a lot of information directly relating the edibility of NZ fern hybrids, haha. Pretty much all I found is that the bulbiferum is edible (and some other species not distinct to NZ), and that a lot of ferns are carcinogenic… I guess I might just have to hunt down a real hen and chicken fern. Can this fern be propagated by division of the root ball? Older fronds will eventually collapse to the ground too. Sorry, I scrolled down too quickly. It seems you have answered my question already. When do the “chicken” ferns grow? Does it depend on the season, size or other? I’m not sure how to age a hen and chicken fern other than bigger plants are generally older than smaller plants. They are fairly slow growing, and bad growing conditions will hamper them further. Even small hen & chickens ferns can produce bulbils. But bigger plants obviously produce more bulbils. I suspect bulbil production can be influcened by environmental conditions, but I’m not sure exactly how (perhaps more bulbils in wetter, darker conditions?). Bulbil production, even amongst Asplenium bulbiferum plants (or amongst Asplenium xlucrosum plants), does seem quite variable, and perhaps it has a genetic basis. Of course, A. gracillimum generally produces very few bulbils (usually none, or only a few towards the tip of the frond). On a given frond, it takes about a year for bulbils to start to form. The bulbils are only at their best – each with several little fronds – after the mother frond reaches two or three years of age. You can spot the positions where bulbils will form even before they start producing little fronds; they first appear as tufts of little black scales on the upper surface of the mother frond. Hi i was wondering how you are able to tell the age of a hen and chicken fern and whether or not the length or age has anything to do with the amount or number of bulbils on each fern. Asplenium haurakiense probably is edible (holds for all of the NZ Asplenium ferns). However, it is usually a fairly small fern, so the pikopiko or unfurling new fronds are going to be quite small, and you’d need a lot of plants to get a decent quantity. Hen & chickens fern has the advantage of being quite a big plant, so you can get a decent sized pikopiko from them. You could also try shining spleenwort (= huruhuruwhenua or Asplenium oblongifolium). It also grows fairly big, and tolerates dry conditions, so it might do well under the pohutukawa. It’s probably also easier to get hold of than Asplenium haurakiense. It would be unusual to get hen & chickens fern growing naturally under pohutukawa, unless it was where a forested stream reached the beach. 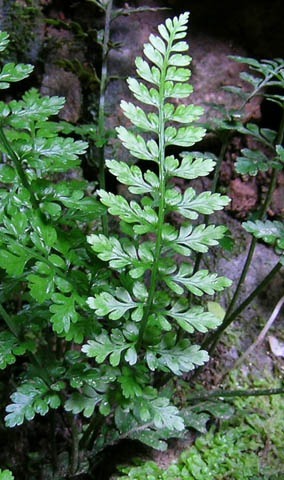 However, a relative – Asplenium haurakiense; also known as Asplenium flaccidum subsp. haurakiense – does occur naturally under pohutukawa, often amongst the roots. Some nurseries do sell it, so you might be able to track it down. Sorry, I don’t have a pikopiko pesto recipe. If anyone else does, please let us know. Good luck with growing a chicken. From my limited attempts, I’ve found the bigger the chicken plantlets, the more likely they are to survive. Big chickens can have four or five (or more) small fronds. if you do know the answer could you please email me at the address below. Also – If you have a recipe for pikopiko pesto it would be appreciated. There is a true Hen and Chicken Fern growing in my fish pond, my father dug it out of Stewart Island Bush roughly 20 years ago, been growing great since! I just plucked of one of the Chickens and stuck it in a jar, hopefully it will grow. Yes, even quite different plants can be given the same ‘common’ name. And a single kind of plant can be known by many different ‘common’ names, especially if it is a species that occurs in many countries. This is why botanists tend to use scientific names (i.e., the latin names) when the communication needs to be precise. At any given point in time, under the international rules for naming species, each species can only have one scientific name and each scientific name can only apply to one species. That is, there should be a one-to-one correspondence. Of course, as knowledge changes (improves? ), the circumscription/application of a scientific name can change and/or the scientific name of a species be updated. Aside from the metaphor of the bulbils being chickens and the frond the mother hen, no, I don’t think there is any direct link. HOWEVER, slugs and snails seem to love spleenwort/Asplenium ferns, including the hen & chickens ferns. So, if you manage to establish a good crop of hen & chickens ferns, you might also sustain a reasonable population of pesky molluscs that might in turn keep your chickens happily occupied and fed! Here’s an interesting example of regional difference in names. In the US Hens and Chickens refer to a totally different type of plant, small rosette shaped succulents that send out smaller “babies” around it. does hen and chicken fern have anything to do with Hens and Chickens? I have hens and am wondering if there is any health giving advantages to grow these ferns for my clucky crew! 🙂 Love the images!